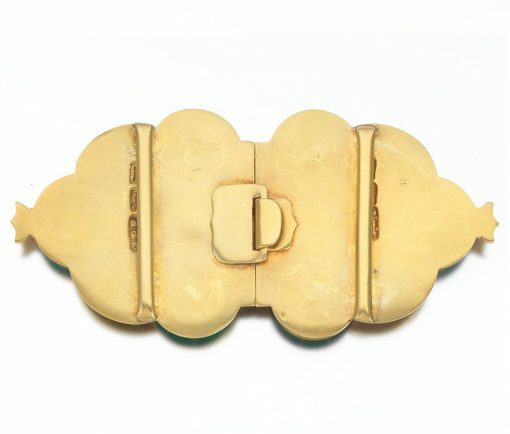 An 18-carat gold, two piece belt buckle in Celtic-Revival style. It is decorated overall with Celtic motifs of intertwined knots and dragons in relief with polychrome enamelled dome accents. Signed: Hopkins & Hopkins, goldsmiths and watchmakers, Dublin, circa 1903. In original box. 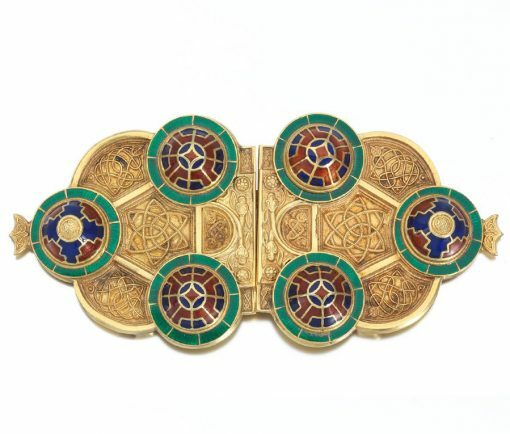 Hopkins and Hopkins took their inspiration for this jewel from the Ardagh Chalice which dates from the 8th century AD. 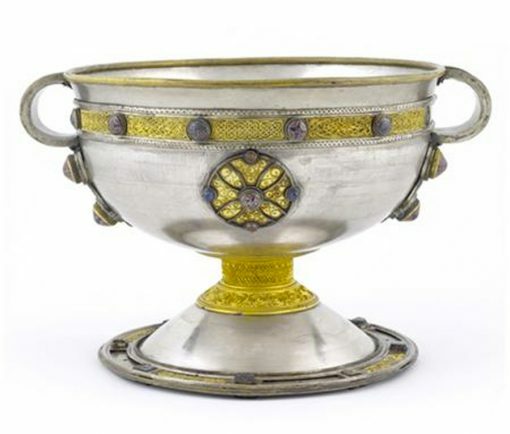 That chalice represents a high point in early medieval craftsmanship, as do the Tara Brooch and the Derrynaflan Paten, all of which are in the National Museum of Ireland. The Ardagh Chalice is one of the greatest treasures of the early Irish Church. 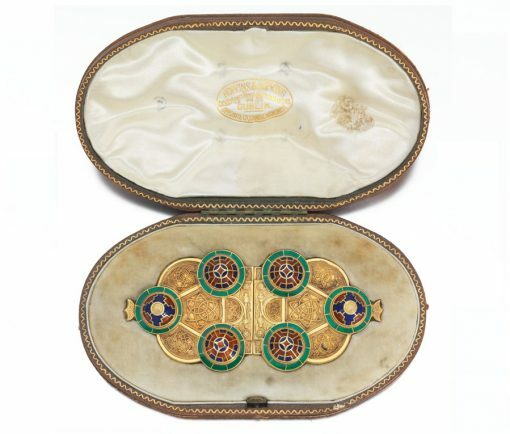 It is part of a hoard of objects found in the 19th century near Ardagh, Co. Limerick. The silver chalice was used for pouring Eucharistic wine during the celebration of Mass. The outside of the bowl is decorated with applied gold, silver, glass, amber and enamel ornaments. Incised animal decoration can also be seen below two handles, which are decorated with elaborate glass studs and filigree panels. Hopkins & Hopkins went on to use similar decorative embellishments and motifs in this belt buckle.